Mirroring debates in the US, members of universities in the UK are increasingly concerned with the diversity of students and faculty in higher education institutions. Drawing on a methodology developed at Dartmouth College, John Carey, Katie Clayton, Simon Hix and Yusaku Horiuchi present a fascinating analysis of the results of a 2017 survey of the views of LSE undergraduates on student admissions and faculty recruitment. Overall, LSE students emphasise “scholarly excellence” in their expectations of fellow students and of faculty, but also favour a focus on offering places to applicants from lower income families and from non-selective state schools. As with many social phenomena in the past century, the US debates about diversity on university campuses have started to cross the Atlantic to the UK. Perhaps the most high-profile example of this was the argument in 2015–16 about whether Oriel College, Oxford should remove the statue of Cecil Rhodes, who for many students was a symbol of Britain’s colonial and racist past. Another example is the growing recognition of the lack of students and faculty from black and minority ethnic backgrounds at Britain’s top universities (here, here, and here). And, in perhaps a UK-specific take on the US debates, top universities are increasingly asked why they have so few students from lower income or working class backgrounds. For example, The Sutton Trust estimates that pupils from private secondary schools are more than twice as likely to attend top universities as pupils from state schools. LSE is no stranger to these debates. In response to growing concerns amongst faculty and students, and as result of a number of incidents on campus, in September 2015 LSE set up an Equity, Diversity and Inclusion (EDI) Taskforce. The number one aim of the EDI Taskforce is: “To provide a forum in which those with operational responsibilities for equity and diversity in the School are held accountable for and supported in the delivery of their responsibilities”. But what do LSE students think about these issues? Do they want a more diverse student intake and more diverse faculty appointments? And how do they think LSE should go about achieving more student and faculty diversity – for example, should certain student or faculty characteristics be prioritised over other characteristics? And are LSE students polarised in their views of these issues? We could simply ask LSE students what they think. But a problem with conventional surveys on sensitive issues is that they are susceptible to what researchers call “social desirability bias”. For example, if a student is not in favour of greater campus diversity, he or she is unlikely to reveal that opinion in response to a direct survey question – or he or she may simply exit the survey when asked about hot-button issues. 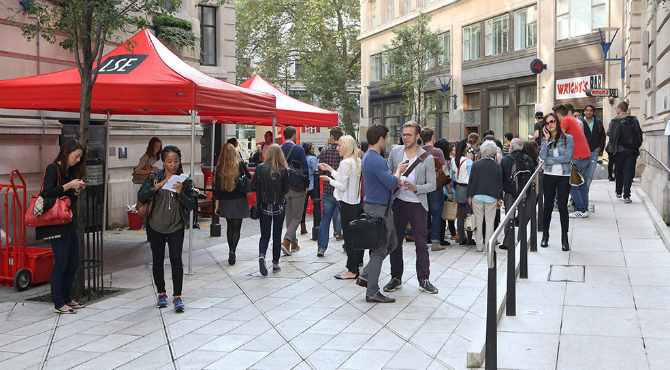 Image credit: Houghton Street during Orientation Week by LSE in Pictures. © London School of Economics (all rights reserved). To mitigate this problem, we conducted a survey experiment of LSE undergraduates, using a technique known as “fully randomised conjoint analysis”. In this design, each respondent is presented with several pairs of hypothetical student applicants (or candidates for a faculty appointment), and in each case the respondent is asked which person they would prefer to be accepted (or appointed). Each hypothetical student (faculty) applicant is described with a bundle of attributes that include race/ethnicity, gender identification, income and class background, and several other attributes . The particulars of each attribute (such as whether a person’s race/ethnicity is white, black or Asian) are randomly assigned for each candidate. The order in which the attributes themselves are presented is also randomly shuffled for each respondent. This way, no attribute is inadvertently made to seem especially important just by being placed first. Our email invitation was also written in general language, focusing on student opinions about admissions and faculty recruitment, but not priming the specific issue of diversity. Each respondent then chooses one candidate in ten randomly juxtaposed pairs of candidates. Using the answers of hundreds of respondents and thousands of decisions with the attributes randomised, we can estimate whether, and how much, respondents care about accepting a black student as opposed to a white student, or a student from a lower income background, or an applicant with outstanding academic grades, or a female or male faculty member, or a faculty member with a PhD from a top university, or a faculty member with an outstanding teaching record or research record, and so on. In short, this design allows us to elicit students’ views about campus diversity without ever mentioning diversity. It is not that we are misleading the respondents in any way. But, rather, from the point of view of the students taking the survey, the research is asking them about their views on a range of attributes of students and faculty that they might care about. And their responses shed light on the relative strengths of their priorities across the multiple dimensions on which admissions decisions or faculty recruitment decisions are made in the real world. After they had completed the conjoint experiment, we asked the LSE students who took the survey about their own academic department, extra-curricular interests, academic grades (in their A-levels or IB (International Baccalaureate)), gender identity, race/ethnicity, political party support, whether their parents attended university, their family’s income, and their general views about diversity at the university. This allowed us to see whether students’ personal backgrounds and experience influences their views about student or faculty diversity. This method was pioneered at Dartmouth College, which is one of the top undergraduate colleges in the United States, with fascinating results. After seeing these results, we wondered what we would find with the same survey design at LSE. We undertook the survey in January–February 2017. We surveyed all 4,785 LSE undergraduates on continuing courses (so not counting visiting students), and randomly split the sample in two: asking half the undergraduate admissions survey, and the other half the faculty appointments survey. We secured 494 responses to the undergraduate admissions survey (a response rate of 21 per cent) and 384 for the faculty appointments survey (a response rate of 16 per cent). These are comparatively high response rates, and we found no evidence that the respondents were biased in any way relative to the general population of LSE undergraduates. We interpret the results from our conjoint analysis by estimating the average marginal component effect (AMCE). The AMCE tells us how much a respondent is more or less likely to choose a hypothetical candidate with a particular characteristic — for example, a black candidate over a white candidate (if white is the baseline), or a woman rather than a man (if man is the baseline) — when all other characteristics are held equal. The figures below illustrate the results across the full set of respondents to each survey, first for admissions then for recruitment. Each attribute (for example, race/ethnicity, gender, A-level results etc.) can be assigned various levels (characteristics of the candidate). The baseline level for each attribute is identified, and serves as the point of reference. For each level of each attribute, the AMCE estimates the difference in likelihood that a respondent chooses a candidate with that attribute/level, relative to a candidate with the baseline attribute/level, holding all other attributes and levels equal. A positive AMCE indicates that respondents are more likely to prefer candidates with the given level relative to the baseline level, whereas a negative AMCE indicates the reverse. The lines intersecting the dots (which look like wings on an airplane) show the confidence interval around each estimate. (Where the “wings” are not visible, the confidence interval is smaller than the size of the marker.) If a confidence interval intersects the vertical line on each figure, then the estimate is not discernible from zero at the standard 95 per cent degree of confidence. Overall, where undergraduate admissions are concerned, LSE students are selectively supportive of more diversity in admissions. Given equal academic standards, LSE students as a whole are 5 per cent more likely to prefer a black applicant for admission over a white one. Respondents were statistically indifferent between East Asian and South Asian applicants relative to whites. They leaned just slightly toward women applicants over men. 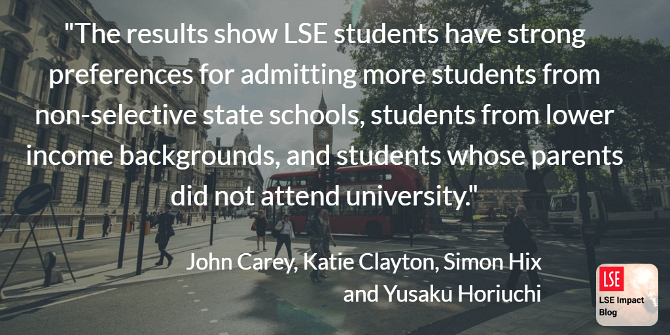 The results also show that LSE students have strong preferences for admitting more students from non-selective state schools (as opposed to private schools or selective/grammar schools), students from lower income backgrounds, and students whose parents did not attend university. Regarding faculty appointments, LSE students have a strong preference for appointing academics with PhDs from top universities and with excellent scholarly and teaching records. Other things equal, shifting from a fair research record to an excellent one increases likelihood of selection by 24 per cent, and the same jump on a teaching reputation boosts selection by over 40 per cent. Holding these high academic standards constant, LSE students would also like to see more women appointed (shifting from a man to a woman increases likelihood of selection by 5 per cent), more black faculty (6 per cent), and more permanent faculty (3 per cent). LSE students also prefer appointments in mainstream academic departments/programmes, such as Economics or Government/Political Science over those in Development Studies (-6 per cent) and Gender Studies (-8 per cent) (neither of which have undergraduate programmes). 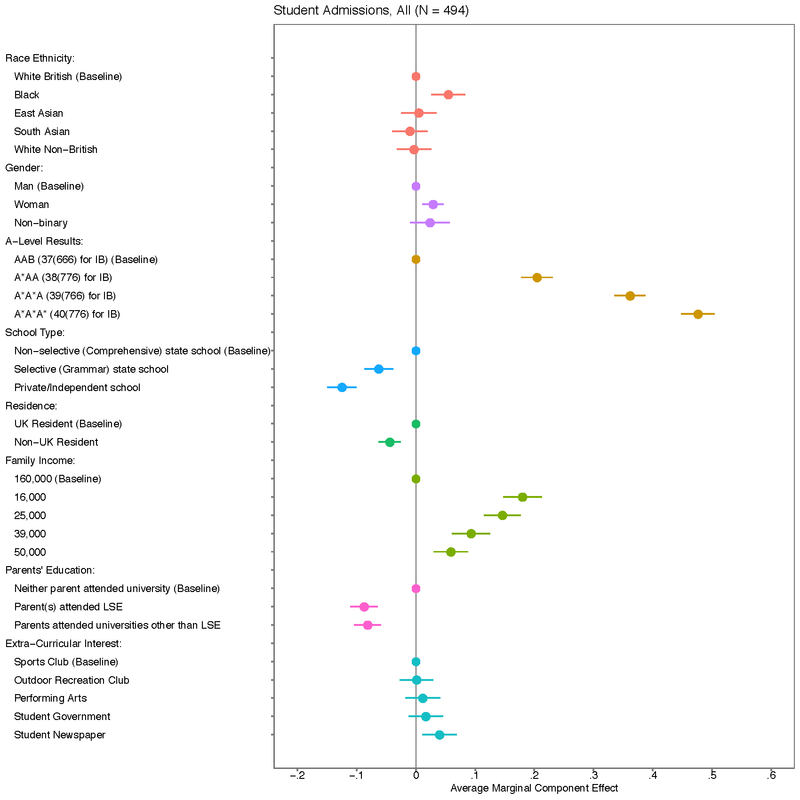 These results were broadly consistent with those we found among students at Dartmouth. Like LSE, Dartmouth students placed great weight on academic excellence, both in student admissions and in faculty recruitment. They also expressed clear preferences for candidates from traditionally under-represented groups. The race/ethnicity categories we used in surveying American students differed somewhat from those included in the LSE survey, reflecting the US demographics by including Latinos and Native Americans, and not distinguishing between South Asians and East Asians. 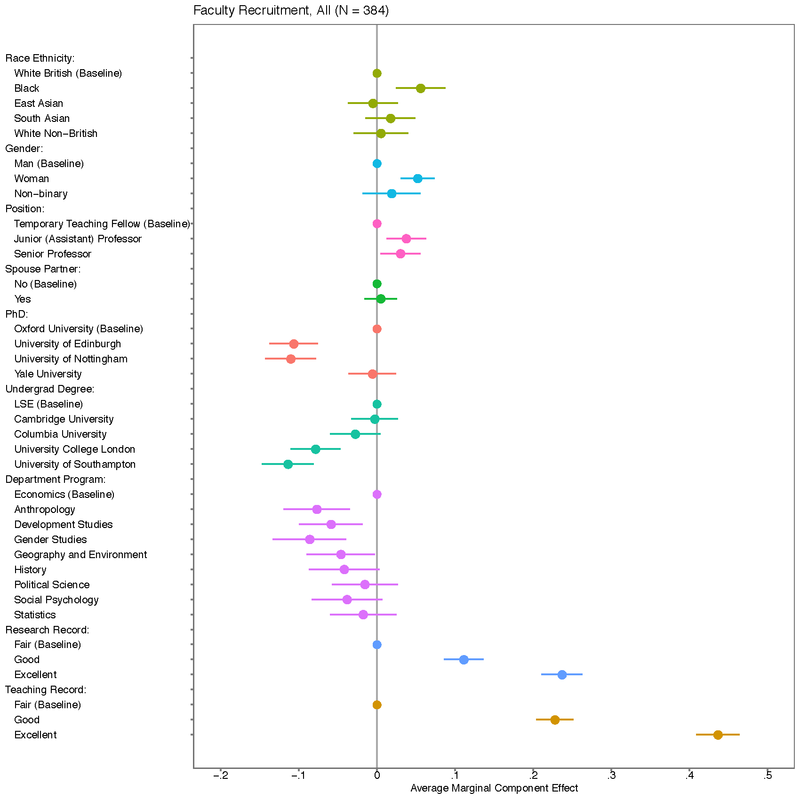 Nevertheless, the Dartmouth students expressed statistically significant preferences in favour of members of most non-white groups, and the marginal preference for a black applicant or faculty candidate at Dartmouth, other things equal, was on par with that among LSE students. We were also able to break the LSE results out by different groups of respondents. We found that non-white LSE students weigh academic merit in student admissions more highly than do white students, and that women students are more likely to favour women and non-binary applicants than are men. We found little difference between men and women students in terms of their faculty appointment preferences, even on the gender of faculty. We also looked at whether students on “quantitative” programmes (in Accounting and Finance, Economic History, Economics, Management, Maths, and Statistics) have different attitudes towards diversity from students on “qualitative” or “mixed methods” programmes (in Anthropology, Geography, Government, History, International Relations, Law, Philosophy, Social Policy, or Sociology). On undergraduate admissions, students on qualitative/mixed-methods courses slightly favour female applications and applicants from lower income families, and slightly discount high A-level/IB grades and private schools. On faculty appointments, students on qualitative/mixed-methods courses have slightly stronger preferences for women faculty. But the preference differences across students in these two types of programmes are matters of degree, not of kind, and both types of students overwhelming favour applicants and faculty candidates with very high academic performance. Finally, we found some big differences in the diversity preferences of Conservative-supporting as opposed to Labour-supporting students. On undergraduate admissions, Labour students (compared to Conservative students) are far more favourable toward ethnic minority applicants of all types, with increased likelihood of selection relative to white applicants at between 10 per cent and 20 per cent, other factors equal. It is worth noting that Conservative supporters do not disfavor applicants from any minority group relative to whites — they are, statistically, indifferent to race and ethnicity. The difference stems from Labour supporters’ strong preferences for diversity. Labour students also weight A-level/IB grades less heavily, and favour applicants from non-selective schools, and from lower income families. By contrast, with respect to faculty appointments, we found hardly any differences between Conservative-supporting and Labour-supporting students. We also asked our respondents whether, in principle, they favour the consideration of race in university admissions and faculty appointments, or believe these decisions should be based entirely on academic merit. Large majorities — 75% for admissions, 87% for appointments — favoured merit only, and, consistent with that position, those respondents displayed no statistically discernible preference for or against applicants or candidates of any particular race or ethnicity relative to whites. In sum, LSE students broadly and powerfully prioritise scholarly excellence in both faculty appointments and student admissions. Other things equal, they also want race and gender to be taken into account, and in student admissions they also favour applicants from lower income families and from non-selective state schools. Part of the challenge in recruiting diverse student and faculty populations, of course, arises when all else is not equal — that is, when admissions or recruitment committees must weigh trade-offs across different attributes in selecting candidates for limited slots. The Dartmouth team is pursuing ongoing research into how those students and faculty navigate these trade-offs, drawing on conjoint experiment data from across a range of universities that will provide more leverage on these multi-dimensional decisions. For now, the survey experiments at LSE deliver us a new window on what our student population thinks about how matters of diversity should weigh in admissions and recruitment. For the survey of student applicants, the attributes were: race/ethnicity, gender, home/overseas residence, annual family income, secondary school type, parents’ education, A-Level / IB (or equivalent) grades, and extra-curricular interests. For the survey of faculty appointments, the attributes were: race/ethnicity, gender, home/overseas residence, teaching record, research record, PhD institution, undergraduate institution, LSE academic department, the level of the faculty position, and their spouse/partner’s faculty status. This blog post originally appeared on the LSE Equity, Diversity and Inclusion blog. John Carey is the John Wentworth Professor in the Social Sciences in the Department of Government at Dartmouth College. Katie Clayton is an undergraduate student at Dartmouth College, majoring in Government and French. Simon Hix is the Harold Laski Professor of Political Science in the Department of Government at the LSE. Yusaku Horiuchi is Professor of Government and Mitsui Professor of Japanese Studies at Dartmouth College.